Mark your calendars NOW for the 2015 Steinhatchee Seafood Festival, on April 17 and 18. 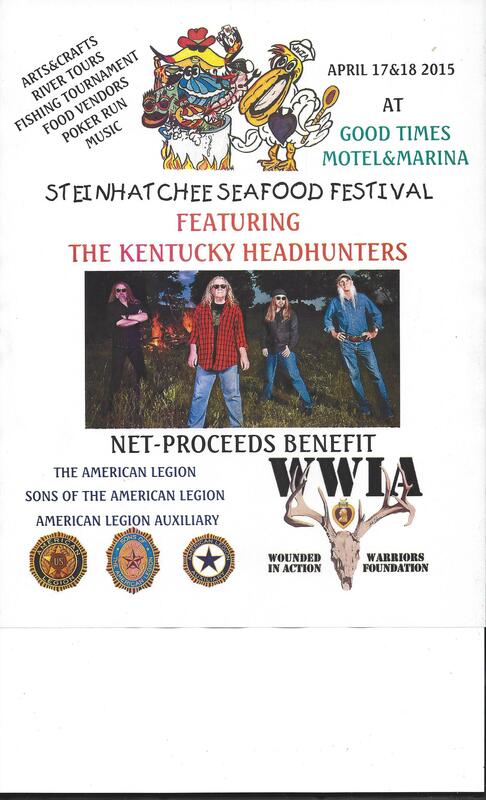 It’s going to be lots of fun, good food, a fishing tournament and a performance by the Kentucky Headhunters. The main venue will be Good Times Marina, located on the “Jena side” of the Steinhatchee River. All net proceeds from the event will be donated to the Wounded Warriors in Action Foundation. checking to see if you had any spots for food vendor! we sell chicken tenders/fries , corndogs,fried pickles, fried tomatoes, fried twinkys, fried oreos! fried chicken sandwich! Kendra…it’s my understanding that the food is “under control” for the event, but you might ask Martin Pierce at Good Times Marina if there are any more slots open. ME and my family is going an dmy girlfriend and i cant wait tell it bz it is going to be fun.We will enjoy it alot I am going to say see yall there!! !